LMS’s have varying levels of reporting. All allow you to see which users completed a course, and what their score was. But adding a tool like the free Google Analytics will allow you to get an even more complete picture of how your users find, use, and interact with your LMS. Here are 10 questions you can answer after adding Google Analytics code to your LMS. 1. What Devices Are People Using? We’re in the BYOD (Bring Your Own Device) era. Employees expect to be able to access content on whatever device they have at the moment. You may think everyone trains from the desktop, but examine the Mobile Devices (Audience > Mobile > Devices) report to get the facts. You may even want to consider adding mobile training to your LMS to let people learn on the go. 2. Which Browsers Are Learners Using to Take Courses? 3. When and Where Does Training Happen? Think all training happens during work hours? Think again. Your analytics reports can show you exactly when your learners access your courses. Recent studies have shown a significant portion of training happens at home in the evenings, or on the weekend, when busy people finally have some down time to complete that course. You can check Audience > Demographics > Location to see if users are logging in from home, and Audience Overview > Hourly to see the times of day visitors arrive. 4. How long does it take learners to complete a course? You know how long a course takes to complete, but that assumes everyone finishes it in one sitting. This doesn’t happen as often as we’d like. With analytics goals, you can track when people start and finish a course, and the number of sessions or days between those two events. To set up goals in analytics, navigate to Admin > Goals and enter the the start and finish URLs for your courses. 5. Where Do Users Have Problems? Let’s face it, most LMS’s aren’t going to win any UX awards. You can diagnose pages on your LMS that have users confused by looking for high bounce rates. A “bounce” occurs when someone leaves a page without interacting with it. This typically means a user looks at a page, but can’t figure out what to do next or becomes frustrated, then leaves. To check bounce rates by page, see Content > Site Content > All Pages. 6. Where Do Users Have Problems, Part II? Bounce rate works when looking at a page in isolation, but usually it takes several pages in succession to complete an action. You can monitor how quickly users are able to enroll in a course, for example, by setting up funnel tracking in Google analytics. By telling Google which pages in your LMS represent successive steps in the funnel, you can see what percentage of users fail at each step of the process. You can also use this method to determine how effective changes you make to your LMS are at helping learners finish their tasks easily. To set up a funnel, add a goal, then check the “use funnel” option. Here is a great guide. 7. Which Promotional Campaigns Work Best? You have a great learning program, but need to make sure the word gets out. You use email blasts, post on the corporate intranet, or even have posts on the company blog. By using a tool like the Google Analytics URL builder, you can attach valuable meta information to links, tweets, posts or emails you send out to learners. When readers click on those links, analytics records their actions and you will be able to see which efforts had the best response. Not only can you see the volume of clicks for each outreach effort, but also how many enrollments resulted from it, how much time they spent in the LMS, and which courses they visited. See the report in Traffic Sources > Sources > Campaigns. 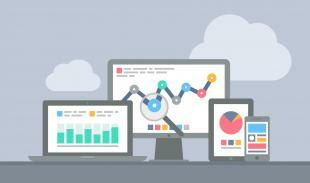 Google only recently announced analytics support for tracking users across multiple devices. Up to now Google depended on tracking browsers, so a single user from three different devices would count as three different visitors! Finally this has been fixed, and a single user can now be tracked across all their various devices, giving you a clearer picture for your true number of visitors. See the announcement. You can easily see the browser type and version of your LMS visitors, but you can also look into the version of flash and Java support their system has. As many learning modules are still flash dependent, letting your developers know which versions of flash your users have can head off compatibility issues down the road. See Audience > Technology > Browser & OS > Flash Version. 10. What Social Media Traction Is Our Learning Getting? As social learning becomes more prevalent, tracking how many interactions are generated from your content, and which networks drive learners to you becomes more critical to understand. Google analytics has beautiful social media referral reports broken out by network and content. You’ll be able to break out which posts/courses generate the most reaction from learners, and track the spread of your content across social media. Of course if you track them with the Analytics URL builder mentioned earlier, your data will look even cleaner. See Traffic Sources > Social for the suite of great reports. Do you have Google Analytics installed in your LMS? If so, what insights have you discovered that helped improve your learning program?